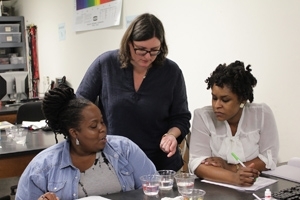 American University science and education faculty and students are working with middle school science teachers across DC to develop and implement student-centered, investigative science curriculum for their classrooms. This work includes developing an intensive professional development relationship with one school in particular, Ideal Academy Public Charter School. The program, named the Learning and Teaching Science with Scientists Institute, is funded by a Mathematics and Science Partnerships Grant through the DC Office of the State Superintendent for Education (OSSE). Over the summer, 14 teachers participated in a training institute at American University, focusing on laboratory approaches to learning biology, chemistry, physics, and environmental sciences, as well as pedagogy, or how to use student-centered experimentation as a best practice for teaching and learning science. For example, if a teacher walks into a classroom and lectures on electricity to 7th graders, they will get a very different reaction than if they have the students work on building their own snap circuits. Of the 14 teachers, 4 work at Ideal, and 10 work at other schools across DC. During the summer, teachers developed and tested lesson plans to teach the science approaches learned in the institute, using the experiential strategies taught in the pedagogy course. While the summer institute is over, work on the project continues. During the fall semester, four AU science students went to the schools across DC to observe teachers implementing lesson plans in their science courses. These lesson plans were developed using the best practices taught this summer, including the “5Es” of science instruction: Engage, Explore, Explain, Elaborate and Evaluate. AU’s science students used an observation protocol to help determine whether teachers were using their new skills, and whether these skills were helping students learn. In addition, three AU science students, Nikita Srivastava, Kirk Blackmoore, and Rachel Zayas have been going to Ideal weekly to help 8th grade students with their science fair projects. The school's science fair was held last winter, and Blackmoore and Zayas are evaluating the 8th grade projects. After the school-based fair, AU science students and faculty continue to support the Ideal students whose projects will represent Ideal at a DC-wide middle school science fair. When reflecting on his experiences at Ideal, Blackmoore said, “Working with the budding scientists at Ideal has forced me to improve personally, academically, and socially every single time. The kids are very high-energy and observant, so I need to be ready to help them discover new things and nurture their interests. I have really seen growth in them through the questions they now ask and the way they carry themselves, which is very encouraging. The future is bright in the scientific world.“ The project is allowing AU students and faculty to build strong relationships with staff at Ideal, ultimately helping the school to build and enhance its science curriculum, which should lead to increased student engagement and achievement. “One of the most gratifying moments of the LTSS grant project was when the Ideal Public Charter School teachers told me they had created lab time in their science classes for student centered experiments,” said Nancy Zeller, AU’s recently retired coordinator of science teaching labs and one of the grant managers for the institute. “Students getting excited about snap circuits and observing how bean seeds can germinate on filter paper are the best ways to engage budding young scientists." The project’s funding expires at the end of this school year, but AU hopes to continue its relationship with Ideal in the future.